pep_boys has no other items for sale. Sales tax may apply when shipping to: AL*(4.0%), AZ*(5.6%), AR*(6.5%), CA*(6.5%), CO*(2.9%), CT*(6.35%), DC*(5.75%), FL*(6.0%), GA*(4.0%), ID(6.0%), IL*(6.25%), IN*(7.0%), IA*, KS*(6.15%), KY*(6.0%), LA*(4.0%), ME*(5.5%), MD*(6.0%), MA(6.25%), MI*(6.0%), MN*, MS*(7.0%), MO*(4.225%), NE*(5.5%), NV*(4.25%), NJ*(7.0%), NM*(5.125%), NY*(4.0%), NC*(4.75%), ND*(5.0%), OH*(5.75%), OK(4.5%), PA*(6.0%), RI*(7.0%), SC*(6.0%), SD*(4.0%), TN*(7.0%), TX*(6.25%), UT(4.7%), VT*(6.0%), VA*(4.3%), WA*, WV*(6.5%), WI*(5.0%), WY(4.0%). Purchases made individually may not qualify for free shipping or other applicable promotions Pep Boys operates in 38 states throughout the US. Current law requires us to collect all taxes that are applicable, based on the items purchased, the shipping address. If there is no sales tax included on your receipt, this does not relieve you of the sales tax liability on your purchase. In certain states use tax is imposed and must be paid by the purchaser, unless otherwise exempt. Thank you for a pleasant buying experience!! Perfect item! Thanks a lot! Good deal. Made it here fast. Have had experience with lesser value like items - the old saying "you get what you pay for" applies. This is top of the line and will last for years, just what he needs. Strong durable wheel lock with eye catching chrome finish. 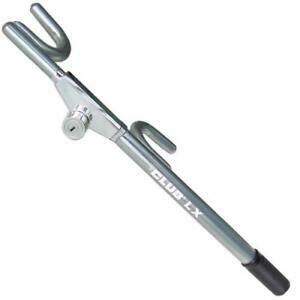 Would highly recommend this product to anyone looking for a steering wheel lock. Very good item at a very good price.